Eight-year bans mark "the end" for Fifa president Sepp Blatter and Uefa boss Michel Platini, says Football Association chairman Greg Dyke. Both were found guilty of ethics breaches over a £1.3m ($2m) "disloyal payment" and suspended from all football-related activities. Having previously backed Platini for the next Fifa presidency, Dyke said the FA had yet to decide who to support. He said that the FA would "make up our minds quite late". 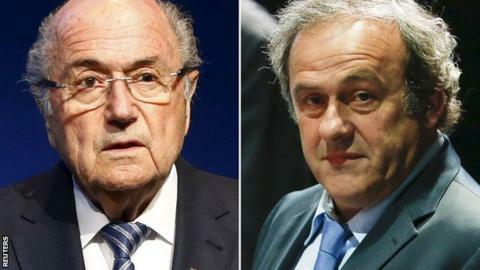 Frenchman Platini, 60, and Swiss Blatter, 79, deny wrongdoing and intend to appeal against their bans to the Court of Arbitration for Sport. The FA suspended its support for Platini in October pending the outcome of the ethics inquiry. Five candidates will now contest the Fifa presidential election to replace Blatter at a special congress on 26 February. "Having opted quite early for Platini - and we had no idea about any of this case - we haven't decided who we are going to support," said Dyke. "We're going to look at all of the candidates in January and February and make up our minds quite late. "To some extent it doesn't matter who becomes president. "What matters is a proper reform programme so the excesses of the Blatter era can't be seen again." The Scottish FA also supported Platini's bid to become Fifa president. In a statement, it said it would be "inappropriate to comment any further" on the verdicts against Blatter and Platini while both are still able to appeal against their bans. Dyke added he had "no sympathy" for Blatter and thought it was "sad" the Swiss could not "separate himself from Fifa". "Any suggestion this corruption was happening, Blatter saw it as an attack on Fifa, which he saw as an attack on himself," added Dyke. However, he said Blatter continued to retain the support of a significant number of Fifa's 209 members following his 17-year reign as president. "This story of corruption has been around for a long time. The weird thing about so many members of Fifa is they were prepared to go along with it. "When I was trying to persuade people not to vote for Blatter last time, a lot of people just said to me that Blatter had been very good to them. "I wouldn't be at all surprised if Blatter stood again tomorrow that he couldn't get 51% of the members to vote for him despite all this." Dyke said the FA wanted to see "an effective reform programme" going forward but added: "I can't see how you end Fifa." "People have looked at it and they can't see a process by which you can get rid of it unless you can get a majority of the 209 members."